ICBA has sent a letter to the federal government’s Standing Committee on Transport, Infrastructure and Communities opposing Bill C-48, a moratorium on oil tankers near B.C.’s north coast. The federal government has committed on many occasions to get Canada’s natural resources to tidewater. The oil tanker moratorium contradicts this commitment. The federal government has a comprehensive $1.5 billion Oceans Protection Plan. If this plan is going to be effective, then why is the moratorium on tankers on B.C.’s north coast necessary? About 1,400 tankers of Alaskan produced oil destined for refineries in Washington state is shipped through B.C. coastal waters every year. What, then, does the tanker moratorium effectively accomplish other than to preclude B.C.’s strategically located ports at Kitimat and Prince Rupert, from working with B.C. and Alberta energy producers and building new markets and supply chain routes for energy exports? The federal government has failed to provide industry with any evidence of environmental or safety gaps – rooted in scientific fact – that the moratorium is aimed at mitigating. Oil has been shipped in tankers off the British Columbia coast since the 1930’s and there has not been a major oil spill involving one of those tankers. There is no corresponding tanker moratorium proposed for any other coastal area of Canada, including the artic and east coasts. This unnecessarily pits “east” against “west” and is an inherently unfair application of federal law. 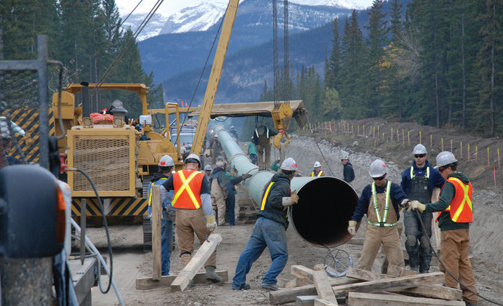 Though the Northern Gateway pipeline is no longer proceeding, the federal government should not erect arbitrary barriers in the marketplace preventing other proponents from pursuing alternative proposals in northern B.C. which appropriately balance economic, environmental, community, and indigenous considerations. This is profoundly regrettable, given the economic benefits which could accrue throughout the energy value chain, including for our members who are small and medium-sized providers of construction services to many facets of the energy industry.